The police of appeasement will not work, he said. 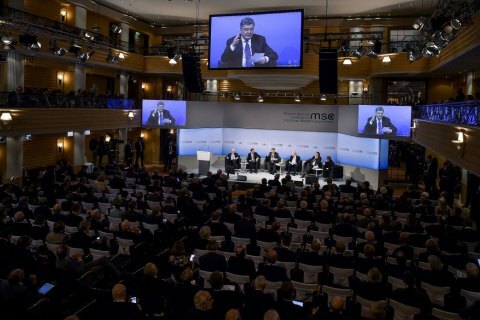 Ukrainian President Petro Poroshenko has said that the international community should not soften its stand on Russia over its aggression in Donbas. He was speaking at the panel discussion entitled "The Future of the West: Downfall or Comeback?" at the 53rd Munich Security Conference. "Thank God, the appeasement policy as regards revanchist and aggressive Russia is not in the mainstream of the Western policy. However, I hear increasingly obsessive calls for at least some degree of appeasement towards Russia's appetites. To move in that direction would be naive, wrong and dangerous. Not only for Ukraine, but also for Europe and for the world," Poroshenko was quoted as saying by his official website. He noted that such policy would not lead to peace, but to greater destabilization. According to Poroshenko, Russian President Vladimir Putin hates Ukraine. "He denies distinctiveness and unique identity of the Ukrainian people. He publicly proclaims Ukrainian identity as a part of Russian dominant identity. He sees no place for Ukraine at the political map of Europe, and he wants to draw a place for Ukraine in Russian colours. But, it would be a mistake to think that the Russia’s appetites are limited to Ukraine only," he said. Poroshenko also thanked German Chancellor Angela Merkel and all leaders of the EU for their contribution to efforts to make Europe safer and bring peace to the Ukrainian soil.